ALL licenced air gunners from Any club can practice with MAAC members during the VSR Air Gun Range Official opening hours. All licenced Air gunners can also participate in shooting competitions organized by MAAC, either as an individual or as a members representing their clubs. The current Airgun Range official opening is Sundays from 07.00 till 12.00 hrs. There is a possibility in MAAC planning to open also Saturdays, however this will be done with bookings. Details will be released later. 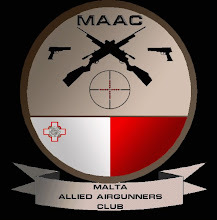 Any Target Shooter - B (Airgun) licensed members from other club are thus welcome to attend the range for shooting practice or participation in MAAC activities and events. Non MAAC must still follow MAAC range regulations and discipline procedures just like any MAAC members. 1. Always carry a copy of the Target Shooter B Airgun Licence. 2. The air guns carried (max 3) must be registered on the TS-B Licence. 3. Must carry a copy of their Target Shooting Insurance Policy. 4. Must carry their club ID. 5. Must Sign a liability form on their first visit which is archived by MAAC. 6. Air guns must be carried in appropriate gun case away from air gun pellets. 7. Can make use of MAAC targets and equipment made available for training purposes. 9. Children under the age of 14 are not allowed in the range. 10. Juniors from 14 till 16 are only allowed if accompanied by their parent or guardian who must sign a liability form taking full responsibility for their presence at the range. 11. Juniors from the age of 14 till 18 who have a TS-B Airgun licence must be always assisted by their guardian to shoot in training or events. 12. Shooters and visitors MUST always follow all instructions given the Airgun Range Conducting Officers. 14. Laser aiming devices are not allowed. (Red Dot Scopes are allowed). 16. The range fee for utilizing the range on Sundays is € 3 for Non MAAC members. This will be paid to the MAAC Treasurer or his assistant upon arrival. 17. The non members attending the range will be also logged for attendance and range fee payment. 18. There is no need for bookings on Sundays. 20. Should other clubs wish to set up a competitive event this must be co-ordinate with MAAC Sporting Commission. * There are some restrictions on air gun power and caliber in certain MAAC competitive events only. ** Depending of activity type and space. For more information please contact us on maacmalta@gmail.com or contact your club office.